For the past decade, The Cabiri, a Seattle-based cirque-inspired performance troupe, has explored the dark world between the living and the dead with its annual Ghost Game series. 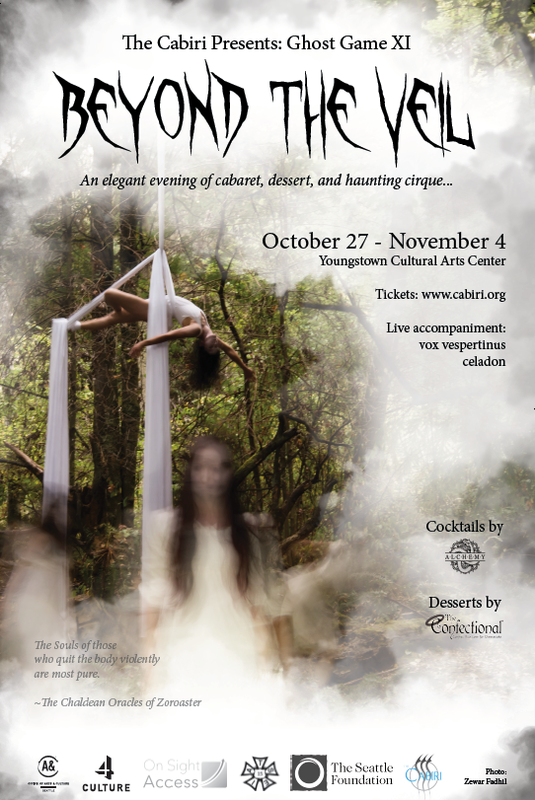 In BEYOND THE VEIL, their 11th annual Ghost Game performance, the talented troupe presents an entertaining evening of ghastly ghost tales drawn from traditional folklore and mythology – just in time for Halloween. The new production draws inspiration from Japanese, Mesopotamian, Egyptian, and Germanic folklore and mythology, including “the Egyptian Book of the Dead” and “The Harps That Once… Sumerian Poetry in Translation” by Thorkild Jacobsen. Each of our five vignettes features contemporary dance, aerial acrobatics, and storytelling as only the Cabiri can bring to life. Beyond the Veil will feature delicious dessert from The Confectional and live accompaniment by celadon and Vox Vespertinus. Bring cash or card and take advantage of our full bar including craft cocktails created especially for the event by Alchemy West Seattle. Beyond the Veil is appropriate for audience members 16 years and older. Festive attire encouraged. PLEASE NOTE: Doors open at 7:30 p.m. for an 8:00 p.m. show every evening.